Elon Reeve Musk (/ˈiːlɒn ˈmʌsk/; born Juin 28, 1971) is a Sooth African-born Canadian-American magnet, ingineer, inventor an investor. 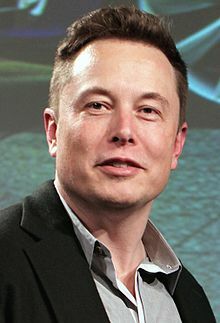 He is the CEO an CTO o SpaceX, CEO an product airchitect o Tesla Motors, an chairman o SolarCity as well as co-chairman o OpenAI. ↑ "Profile: Elon Musk". Bloomberg Billionaires. Bloomberg. Retrieved December 11, 2015. ↑ Musk, Justine (September 10, 2010). "'I Was a Starter Wife': Inside America's Messiest Divorce". Marie Claire. Retrieved November 28, 2012. ↑ "Early Career Engineers, Conferences and Careers". asme.org. Retrieved 2015-11-04. This page wis last eeditit on 3 Februar 2019, at 20:26.